3 colourful new designs using My First Regia - especially soft for babies, machine washable and hard-wearing. 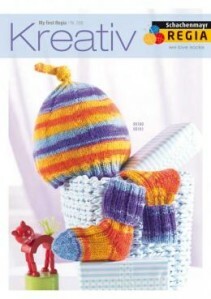 Knit a cute hat (1-2 balls), ribbed socks (1 ball) or booties (1 ball), up to shoe size 18/19. You will also need a set of 5 2-3mm needles, to achieve tension.